Today's guitar amp modeling plug-ins are simply amazing in their ability to faithfully model real guitar amplifiers. From IK Multimedia's Amplitube, to Waves, to Native Instruments, to Line 6, to Digital Performer's included Custom '59, you can plug your guitar directly into your audio interface, dial up a guitar tone in your plug-in software, and play. The sound is simply stunning. But wait. They're ALL MISSING SOMETHING. In fact, they're missing a crucial element of the signal path that simply cannot be modeled in software: the proper input impedance of a real guitar amplifier. When you plug your guitar into your audio interface, the interface's impedance does not match the typical levels found on a real guitar amplifier. No matter how hard you try, you'll never quite be able to replicate the true sound and "feel" of playing into a real guitar amp. The sound will be just a little more thin and unresponsive than the real thing. 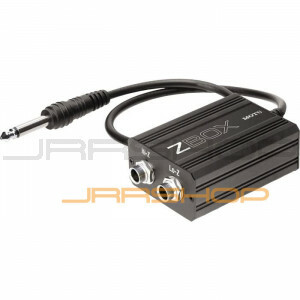 ZBox matches the output impedance (”Z”) of your guitar to the impedance of a non-amp input, such as the mic/instrument preamp inputs on your audio interface. Without proper impedance matching, your guitar won’t sound natural or “feel right”. ZBox’s unique advantage? Authentic matching circuits that emulate the two-jack switching network found on many classic amplifiers, complete with analog simulation of the input tube grid. Only ZBox delivers the most authentic amplifier impedance matching available for the absolute truest sound and “feel” from your guitar. ZBox is the “missing link” for digital guitar processing, providing the hardware-driven input characteristics required to truly emulate a real guitar amp. If you use Digital Performer's Custom 59 amp model plug-in, or a third-party guitar plug-in product like IK Multimedia Amplitube, Waves GTR, Native Instruments Guitar Rig, or similar guitar modeling software, use ZBox to further enhance the authenticity of the tones you play from these products!